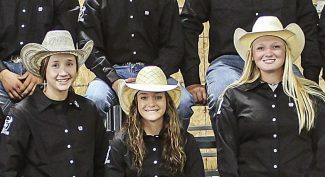 The three women on the Mid-Plains Community College Rodeo Team won the women’s team championship Saturday in Fargo, N.D. Pictured left to right are: Sheyenne Hammond, of Valentine, Mykelsi Schnose, of Oelrichs, S.D. and Danielle Wray, of Ord. For once, it was the women who stole the show. North Platte, Neb. 's Mid-Plains Community College Rodeo Team scored its first women's championship ever during the North Dakota State University Bison Stampede in Fargo, N.D. Colleges are allowed to put the scores of six of its men and four of its women toward each end-of-rodeo team championship. However, MPCC only has three women on its team — Danielle Wray, of Ord; Sheyenne Hammond, of Valentine and Mykelsi Schnose, of Oelrichs, S.D. "Because it takes four to make a full women's team, we are at a disadvantage every time we show up," said Garrett Nokes, MPCC Rodeo Team timed event coach. "That's also what makes the win in North Dakota so special. It's quite an accomplishment to win a team championship with three." "We may only have three, but it's the best women's team we've ever had," Nokes said. "They are all really established and know what they are doing. No one works harder than these three girls. They all get along well and support each other, so they were pretty excited that they made it to the short round together." MPCC took home two other first place finishes in North Dakota — a win in the team roping by Lane Kennedy, of Orleans, and Reed Murray, of Belvue, Kan., as well as a win by Koby Jacobson, of Haiku, Hawaii, in the steer wrestling. "Lane is a two-time national qualifier, and Reed qualified for the (College National Finals Rodeo) as a freshman, so I expect big things from them," said Nokes. "Fargo is the most challenging arena we will face throughout the year because it's so small that it's hard to make runs in. Lane and Reed did a great job of getting in there and just taking care of business. I was real happy to see them win, because there's no doubt in my mind that they should be at the CNFR again. This win will get the ball rolling." Jacobson has made it to the Top 10 in every rodeo he has entered this year. In addition to the steer wrestling points, Jacobson earned third in the bull riding in Fargo, helping to secure MPCC's third place finish in the men's team standings. "Initially, Koby was more focused on bull riding," said Nokes. "He thought that was his main event, but he's been having a lot of success in the steer wrestling because of his pure try and determination. I was happy to see him win the buckle, and thank goodness he did as well as he did because that held our team out of the water. Several of our other standouts didn't have the best weekend, but Koby kept us in there."